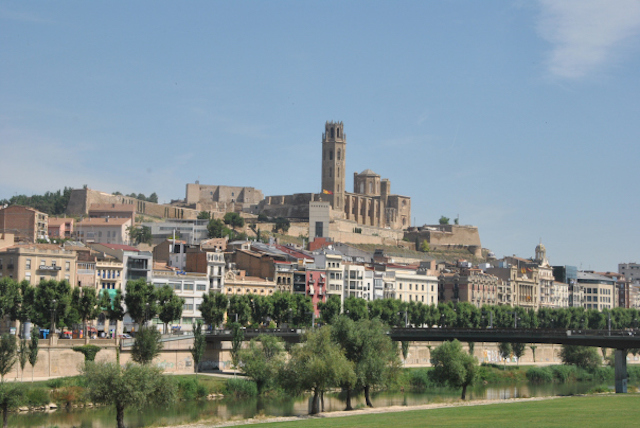 Lleida is the most unknown of the catalonian provinces. Nevertheless it’s an amazing city, because of its location and because of its monuments, located in two nearby areas. The so-called Turó de la Seu awaits us to begin our visit. Here is the Seu Vella, a magnificent Gothic building that was the cathedral of the city until 1713. At that time, and in the framework of the War of Succession, it was converted into barracks by the Bourbon troops and never returned to have a religious function. Next to it, the old Muslim Spanish castle, the Zuda, that years later become Palace of the Kings of the Aragon Crown in the city. Then, we will descend to the center of the city, to cross it along its main artery, el Carrer Major, where some of the most important buildings are concentrated: the old gate Portal Nou with the monument to the ancient Iberian heroes, Indíbil and Mandoni, the Paeria, the old Hospital of Santa Maria, the New Cathedral or the Church of Sant Llorenç, one of the oldest churches in the city. The buildings follow one after another being a sample of the rich heritage that could be saved from the destruction of 1714 and subsequent wars. Licensed tourist guideauthorized by Generalitat de Catalunya during all this tour. The approximate duration of this tour is 3 hours. The order of the tour could be conditioned by the opening hours of the monuments. Transport: Transportation is not necessary for the realization of this visit because it is a pedestrian route. The access to the Seu Cathedral and the Castle of the Zuda can be done walking from the center or through an elevator that joins the Plaza de Sant Joan with the entrance to the site. It will only be necessary for you to go to the starting point. Transport will not be included in our budget, except if you explicitly request it. Optional visits: The visit can be complemented by the Gardeny Castle, headquarters of the Lleida Knights Templar. If you are interested in this visit, ask us to adapt the tour to your needs. If you want to spend the whole day visiting Lleida and its surroundings, tell us about it and we will organize a full day excursion. And if you are staying in Barcelona, do you know that the distance to Lleida is covered by just one-hour travel by AVE?